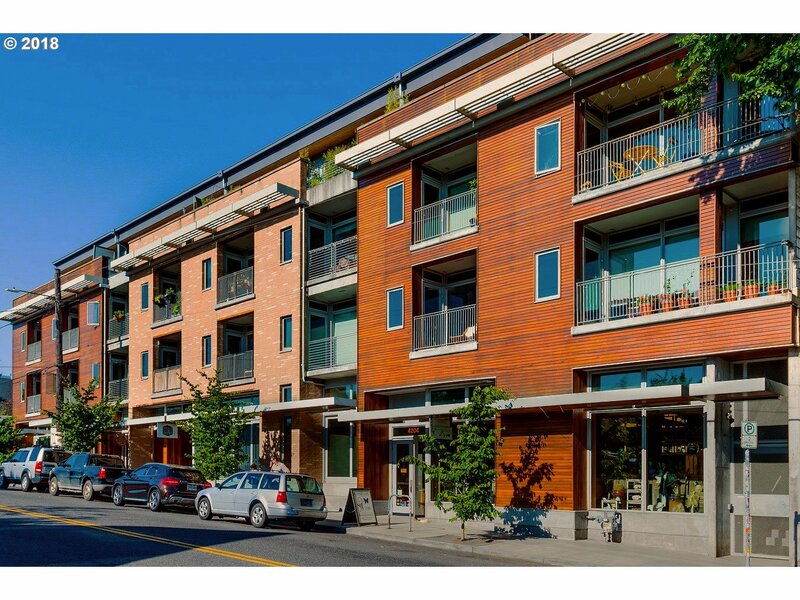 All Mississippi Avenue Lofts homes currently listed for sale in Portland as of 04/23/2019 are shown below. You can change the search criteria at any time by pressing the 'Change Search' button below. "We can now close homes! Penthouse w/ 470 SF Terrace with unobstructed views of Mt. Hood! Mississippi Avenue Lofts, a LEED Gold Condo Building. A boutique community consisting of heavy timber, concrete & steel construction for premium privacy. Jasmine & bamboo welcome you to your front exterior entry through the courtyard. Knotty pine,cork flooring, stainless appliances. Secure parking. Short term rental like AirBnb is permitted!" "We can now close homes! Penthouse w/383 SF Terrace with unobstructed views of Mt. Hood! Mississippi Avenue Lofts, a LEED Gold Condo. A boutique community consisting of heavy timber, concrete & steel construction for premium privacy. Jasmine & bamboo welcome you to your front exterior entry through the courtyard. Knotty pine,cork flooring, stainless appliances. Secure parking. Short term rental like AirBnb is permitted!" "We can now close homes! Mississippi Avenue Lofts is a LEED Gold Condo Building. A boutique community consisting of heavy timber, concrete and steel construction for premium privacy. Jasmine & bamboo welcome you to your front exterior entry through the courtyard. Knotty pine, cork flooring, 85sf balcony & stainless steel appliances. Short term rentals like AirBnb are permitted. Ask about lease to own options!" "We can now close homes! Mississippi Avenue Lofts is a LEED Gold Condo. A boutique community consisting of heavy timber, concrete and steel construction for premium privacy. Jasmine & bamboo welcome you to your front exterior entry through the courtyard. Knotty pine, cork flooring, 85sf balcony & stainless steel appliances. Short term rentals like AirBnb are permitted. Ask about lease to own options!" "We can now close homes! Mississippi Avenue Lofts is a LEED Gold Condo Building. A boutique community of 32 homes consisting of heavy timber, concrete & steel construction for premium privacy. Jasmine & bamboo welcome you to your front exterior entry through the courtyard. Knotty pine, cork flooring, 52sf balcony & stainless appliances. Secure parking & storage avail.Short term rentals like Airbnb are permitted!" "We can now close homes! Urban One Bedroom w/ 92 sf balcony. Mississippi Avenue Lofts is a LEED Gold Condo Building. A boutique community consisting of heavy timber, concrete and steel construction for premium privacy. Jasmine & bamboo welcome you to your front exterior entry through the courtyard. Knotty pine, cork flooring & stainless steel appliances. Short term rentals like AirBnb are permitted. Ask about lease to own options!"